thought i’d highlight some of the easy diy projects i did in the nursery. these are all so. so. so. easy to make! you purchase fabric, and a hoop. place the smaller hoop under your fabric, and then place the top hoop over your fabric and tighten. then cut the fabric hoop from the rest of your fabric, but leave a 1″ variance so you can hot glue it to the inside of the hoop. done. one thing i did before ironing is putting my hoop on and then tracing a rough line of where i want my bunting to go. this made it easier to then line everything up w/o the hoop on for the ironing portion. i made little synched or gathered flowers from left over fabric in the babies room. add a button w/ hot glue, glued my ric-rac w/ hot glue & placed the flowers on w/ hot glue. easy peasy, nice & easy. for these bird canvas’ i followed this tutorial. so easy and so fun! done & done. for my lamp shade i used one i found at target. i ripped the entire lamp shade off to get to the form…then realized there was a ton of nasty stickiness on the top & bottom, so i hot glued bias tape to the top & bottom of the frame. then i used lots of scraps (some i had and some i made by cutting 1.5″ to 2″ strips of fabric) to tie to the sides of the lamp. put on a movie and tied away. the original inspirational post is here. i just had to add some adorable cherry blossoms to her room and basically made my wishing tree over again, but with fake branches from beverly’s. i added a little pink ric-rac to make it not SO dark pink. 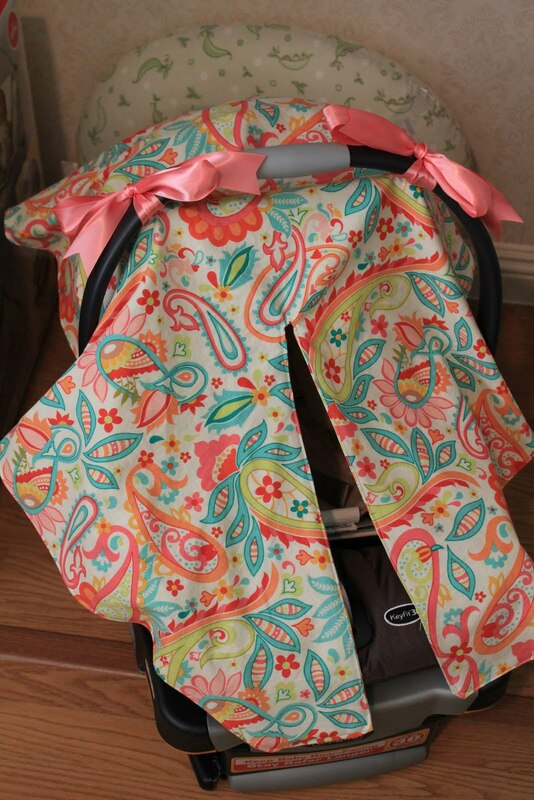 lastly, i made a car seat tent the other day. it was exhausting and easy all at the same time. not sure i’ll make another one, but i do love it!! now i just need a little one to put in it!! i’m going to be linking up w/ a few sites. enjoy looking at all the creative craftiness out there too! have a great weekend. Ooh! That lamp is gorgeous. I really like the colors that you used. The rickrack on the cherry blossoms really makes a cute thing cuter. Great job! 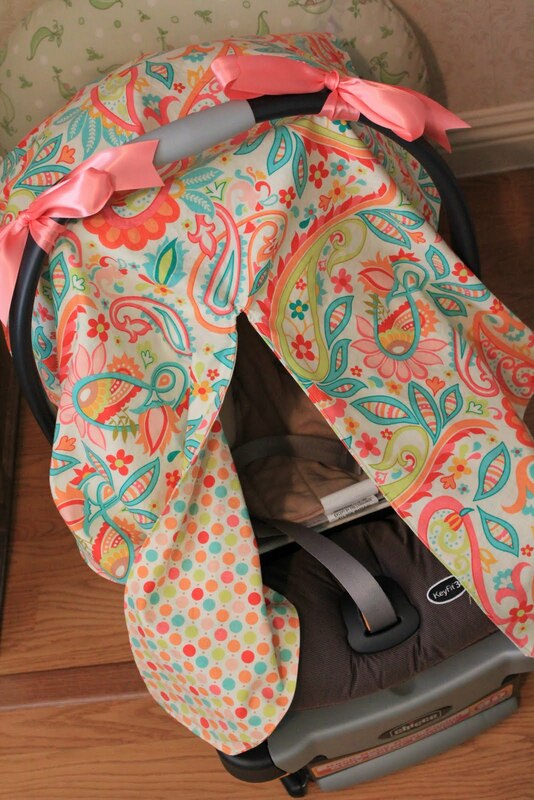 What a fabulous nursery and I love the car seat tent! Wow, it all looks so great! That's one lucky girl. your lamp shade turned out so cute! and we have so many of the same fabrics – fun! This is all very cute! I love your style and the fact that it is all unique to you! Love this post. Makes a little weepy thinking about all the prep and planning that I did waiting for my little babies to arrive. (sniff) Now they are all in school–growing up is bittersweet! Love the fabrics/colors! I love how the simplest things can have the best impact, re: the embroidery hoop art.Your newest follower,Rikka J.Ricochet and Away! Thanks ladies! So excited to get so much love! !